The Dons return to action this Saturday after the international break to face Hearts at Tynecastle. It’s the third trip to the Capital for the team this season and it’s a massive one as they look to continue the momentum going into the Betfred League Cup Semi-Final against Rangers next Sunday. Last time out Derek McInnes’s side comfortably defeated St Mirren 4-1 with Sam Cosgrove, Max Lowe and Connor McLennan all scoring their first goals for the club. Hearts go into this match as league leaders having made an excellent start. From their opening eight games The Jambos have won six, drawn one and lost one with their only defeat coming in a 3-1 loss to Rangers at Ibrox before the break. Like The Dons, Hearts will compete for a place in the League Cup Final next weekend when they face Celtic at Murrayfield. Derek McInnes and Andrew Considine spoke to the media on Thursday lunchtime ahead of the trip to Edinburgh. “Thankfully we’re clearing up although I feel every time I say that we’ve get issues again, but thankfully we’ve had James Wilson, Stevie May, Niall McGinn, Scott Wright, Connor McLennan back on the training pitch. There’s five right away that we were unsure about and Frank Ross is still struggling with his back, McKenna is suspended so he misses out and we’ve had Greg Tansey back on the training pitch. All of a sudden with getting the international players back the squad is looking strong and getting that strength into the training ground and the numbers again is really pleasing for me. It’s a bit more familiarity rather than dealing with players having to pull out every now and then. “It’s huge. I feel we’re still waiting to get going in the league and Hearts have had a flying start apart from their last game. Going down to Tynecastle has always proved to be a really tough game, but we’ve got a few boys back from injury which is great. We’ve had a solid week’s training so looking forward to it and it’ll be a tough task. “There were signs of getting into that rhythm and you want to just keep going, but it probably didn’t come at the right time (the break). We’ve had a very good week’s training and the boys are looking sharp and hopefully we can take that into the weekend. The teams first met in the unusual surroundings of the home of Scottish Rugby due to the construction of the new main stand at Tynecastle and 7,000 Dandies took advantage of the unique experience. In the end The Dons had to settle for a goalless draw with Joe Lewis producing one of his best performances in the Aberdeen goal. Once again, the sides couldn’t be separated in their second meeting during the festive season. The Dons dominated the match but couldn’t find a way past the Hearts defence. Hearts were reduced to ten men late on when Kyle Lafferty chopped down Graeme Shinnie, but it would end in a stalemate. In the final match before the split, The Dons travelled to Edinburgh ahead of the Scottish Cup Semi-Final the following week. Despite Andy Considine’s glancing header catching the upright early on, The Dons went down 2-0 to the hosts, who deservedly claimed the three points with goals from Milinkovic and Naismith. With The Dons still in the mix for second spot, the match against Hearts after the split required three points and nothing else. Thankfully Derek McInnes’ side put in one of their most dominant displays of the campaign and comfortably dispatched a Hearts side who had very little to play for as the season wound down. Sam Cosgrove was given his first start and won everything up front as goals from O’Connor and Gary Mackay-Steven ensured the points remained at Pittodrie. 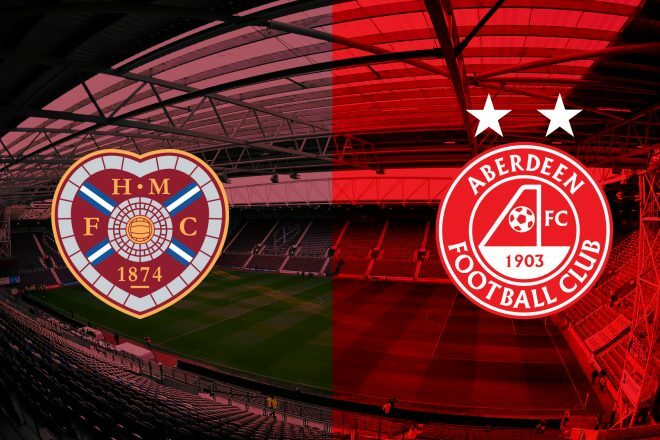 With 31 wins in 133 league trips to face Hearts, The Dons have often found it difficult to overcome the Jambos on their own patch over the years. Hearts have won 63 times with the sides sharing the points 39 times. The biggest Aberdeen win at Tynecastle came in January 1992 when Scott Booth and Paul Mason scored either side of an Eoin Jess double to give The Dons a 4-0 win. For as long as Derek McInnes has been in charge the teams have a near identical record with three wins each and two draws. The last victory in Gorgie for The Dons came at the end of the 2016/17 season as goals from O’Connor and Rooney made sure The Dons would finish second place in the table. At the start of the 2015/16 season, The Dons made it eight wins out of eight with an emphatic 3-1 victory at Tynecastle courtesy of a Goodwillie double and Niall McGinn’s excellent solo effort. Heading to the game? Please click here to view important information about tomorrow’s match. 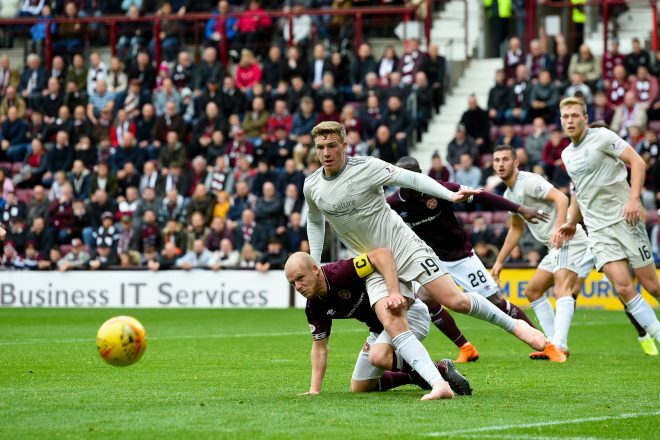 A game of high drama as Hearts held on to beat a spirited Dons side. The league leaders dominated the first half and deservedly found themselves two up, playing some very good football, but the second on the stroke of half time was thanks to very debatable penalty. Aberdeen looked a different side after the break when McGinn and Wright came on. They had a real attacking threat. Mackay-Steven pulled a goal back from the spot and a brilliant save was needed to stop him getting a late equaliser, one that Aberdeen probably deserved for their second half showing which included a Joe Lewis’ penalty save. In the 12th minute, Aberdeen finally had an attacking position when they won a free kick 40 yards out – Ball’s delivery was poor though. Aberdeen were having to work very hard as Hearts were winning all the second balls and were well on top in the middle of the park. On 16 minutes a deflected Djoum shot won the home side corner number four. Devlin cleared twice, his second clearance found James Wilson who played a delightful early ball looking for Mackay-Steven. The winger got himself one on one with Marcus Godinho but the Hearts man made a vital tackle inside the area. Great vision from Wilson though. 18 minutes in, a yellow card for Djoum for a late tackle on Ferguson. Then GMS picked up a yellow card after he had failed to control a cross field pass. The game was being played at an incredible tempo. Aberdeen then had to withstand another five minutes of pressure as four dangerous crosses came over. In the 23rd minute Naismith at the back post might have done better, instead he went to ground looking for a penalty. Joe Lewis then had to receive treatment, a really worrying moment – hopefully the keeper was just using his experience to take the sting out of the game. Hearts had been playing a really high intensity game. They were also playing really well. On the half hour mark Godinho was booked for a foul on Shinnie. Referee Clancy was struggling to keep control as there was so much going on. On 32 minutes nice play released Wilson on the left but his control let him down. Every other touch Wilson had made up to that point had been quality. Hearts then won a free kick on the edge of the area which they took quickly. Considine was forced to make a brilliant tackle to keep out Naismith. The referee actually revealed afterwards that he gave the penalty for handball against Ferguson. Naismith took it and scored, doing down the middle. During the interval Niall McGinn and Scott Wright came on for Dom Ball and Sam Cosgrove. Niall got Aberdeen’s first shot on target after 47 minutes but keeper Zlamal made a comfortable save. The same player then put over a dangerous cross but GMS slipped at the back post as he went for it. On 51 minutes fine play by Scott Wright released McGinn who then saw his cross cleared. 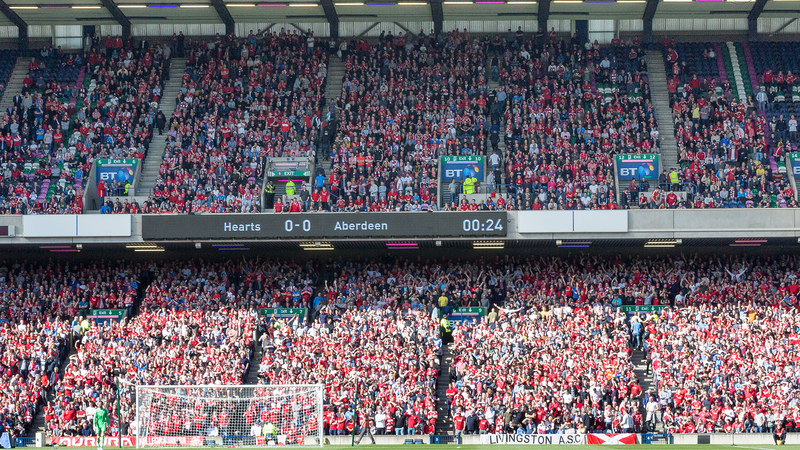 The second half was a completely different game and Aberdeen looked a different side. They were the ones now posing the questions for Hearts. Aberdeen then wasted a couple of good opportunities. McGinn’s cutback failed to pick out a white shirt and then a GMS free kick was over hit. On 61 minutes a Hearts change. Sean Clare replaced Steven MacLean, who had a really good game. Scott Wright, who was finding space, produced a lovely turn on the half way line but could not thread the ball through to McGinn. Then a cross was flicked on by Wilson and GMS’s shot was extremely well blocked by Dikamona. On 76 minutes James Wilson was replaced by Stevie May – the Dons final change. Aberdeen then worked some good openings, but they could not get a shot away. Scott Wright did manage to get a shot on target, but it was weak and easily clutched by Zlamal. The Dons pushed hard but the three minutes of added time came and went. A very good second half performance from the visitors but it was not enough and once again they were left to rue a highly controversial decision.